When I receive an invitation to speak at a women’s conference, retreat or leadership event, I get excited! It’s a privilege for me to partner with churches all across the country and abroad. It’s an honor to be a part of whatever God wants to do in the hearts, minds, souls and lives of the women who attend. So, these dates below are where God has called me to be – and I’m praying over these events until I get there. If you are a women’s ministry leader, pastor’s wife or an event planner, I’d love to hear from you if there is a specific date that you have in mind. Spring and fall dates generally fill up first over summer or winter invitations. You can ask about a specific date by completing the contact form below or email me at barb@barbroose.com. You can check out my speaking topics and watch video clips by clicking here. By the way, if you are just checking out my speaking calendar, check to see if I’m coming to your area. If I am, make sure to invite me over for dinner. Just kidding! 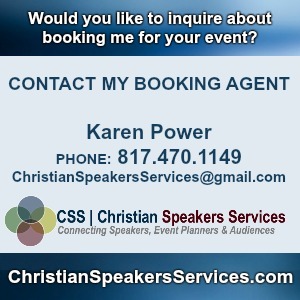 But, if I’m speaking at an event in your area, I’d love for you to attend! More details will be available soon! You’ll be able to download my complete speaker packet, including speaking fees once you complete this complete form and hit submit. Barb is presented by Christian Speakers Services. Would you like to host a women’s event at your church, but you need an idea that would get women excited? Click the button below for an event idea that will challenge women in their faith and give them a chance to laugh, connect and have fun!